Sky Rink has been New York City's most popular year-round indoor ice skating rink since opening in 1969. The twin-rink facility, located on Pier 61 at Chelsea Piers, operates seven days a week, welcoming skaters of all ages and ability levels for general skating sessions. With its stunning architecture and expansive views of the Hudson River, Sky Rink is one of the premier ice skating facilities in the United States. Sky Rink offers both professional and casual skaters a unique and exciting place to skate. Rental skates and helmets for children are available. Group rates available. 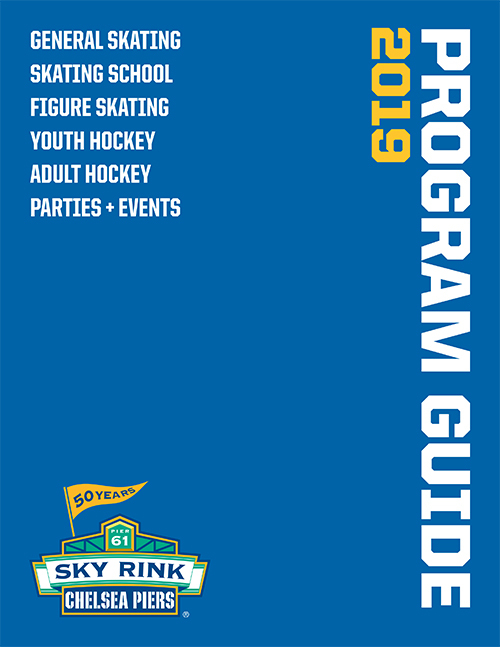 Groups of twelve or more skaters are eligible for a discount by reserving a session with Sky Rink at least 48 hours in advance and paying for all skaters in one cashier's transaction. Skate rental is included. We look forward to welcoming your group to Chelsea Piers! Call 212.336.6100 ext. 6174 to reserve today.